M. Dougherty and E. Byers. 2008. 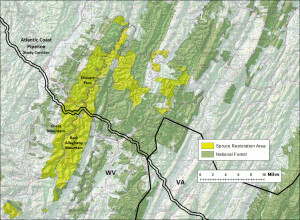 Preliminary Calculation of Landscape Integrity in West Virginia Based on Distance from Weighted Disturbances, Technical Support and Wildlife Diversity Units, Wildlife Resources Section, West Virginia Division of Natural Resources, Elkins, WV. ; Natural Heritage Program, Virginia Department of Conservation and Recreation. 2007. Virginia Natural Landscape Assessment. Webb, R. 2015. Dominion Pipeline Monitoring Coalition Scoping Comments. E.A. Byers, J.P. Vanderhorst, and B.P. Streets. 2010. 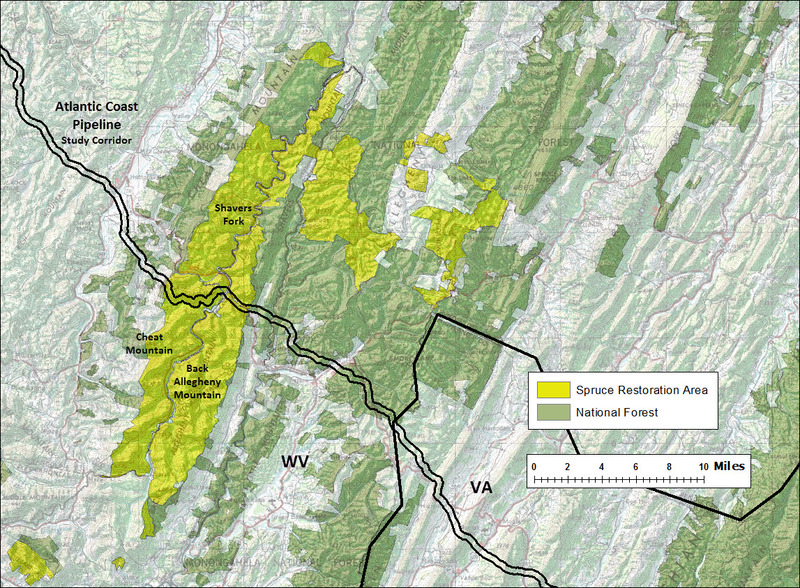 Classification and Conservation Assessment of Upland Red Spruce Communities in West Virginia. West Virginia Natural Heritage Program, West Virginia Division of Natural Resources, Elkins, WV. 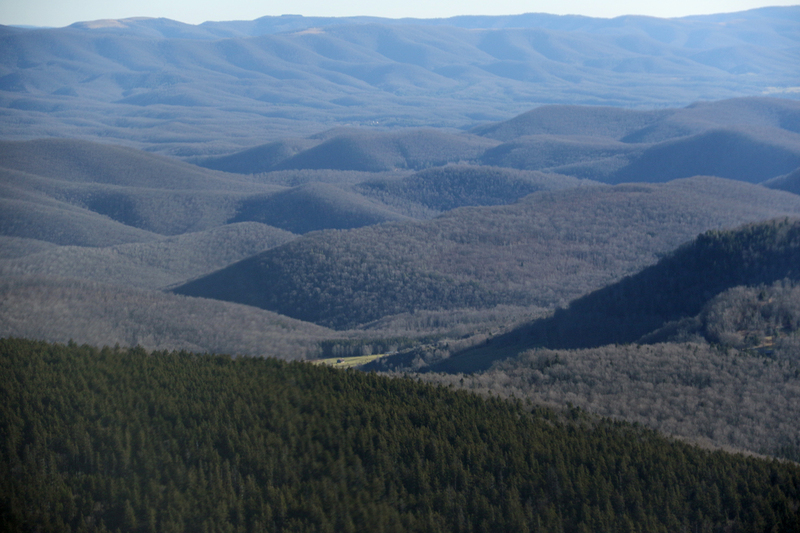 The Central Appalachian Spruce Restoration Initiative is a partnership of diverse interest with a common goal of restoring historic red spruce-northern hardwood ecosystems across the high elevation landscapes of the central Appalachian region. See www.restoreredspruce.org. Resource Report 3: Fish, Wildlife, and Vegetation. 2015. Atlantic Coast Pipeline, LLC and Dominion Transmission, Inc.
USDA Forest Service. 2015. Comments on Route Variations Affecting National Forest System Lands, Atlantic Coast Pipeline, LLC. US Fish and Wildlife Service. 2016. Comments on Dominion Transmission, Inc., Atlantic Coast Pipeline Project. This entry was posted in Alternate Routes, Environmental Review by Rick Webb. Bookmark the permalink. 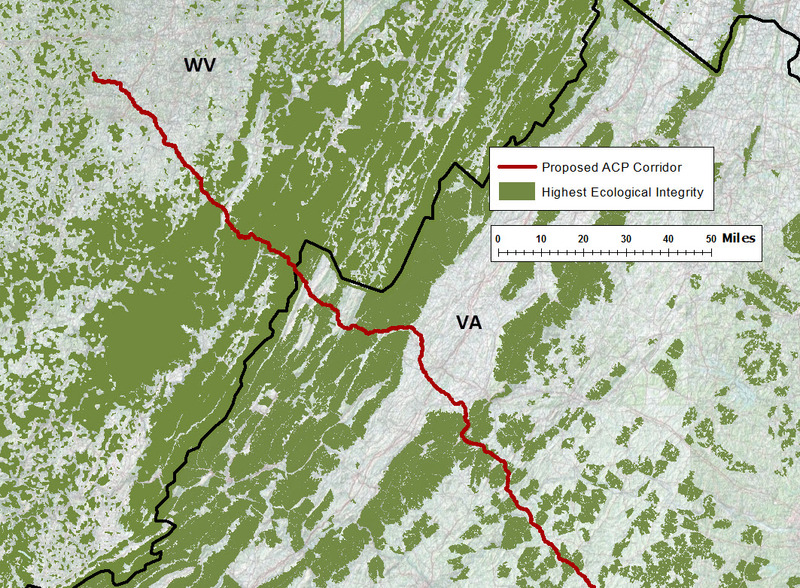 Red Spruce Restoration Area in relation to the proposed ACP corridor. 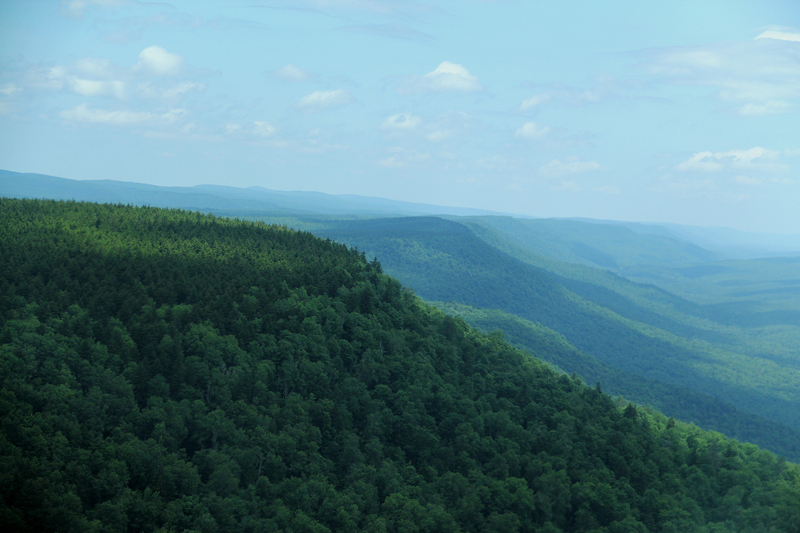 The present-day central Appalachian red spruce forest is a small fraction, less than 10%, of the red spruce forest that was present prior to the intensive logging that occurred in the early 1900s. The proposed Atlantic Coast Pipeline would bisect the core of the remaining red spruce forest in the Cheat Mountain-Back Allegheny Mountain area. 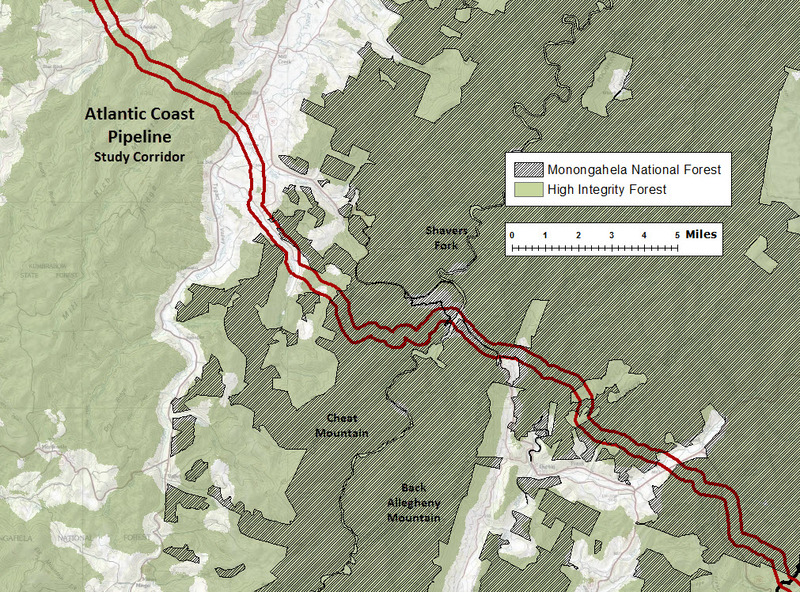 Proposed pipeline crossing area: Back Allegheny Mountain and Greenbrier watershed. 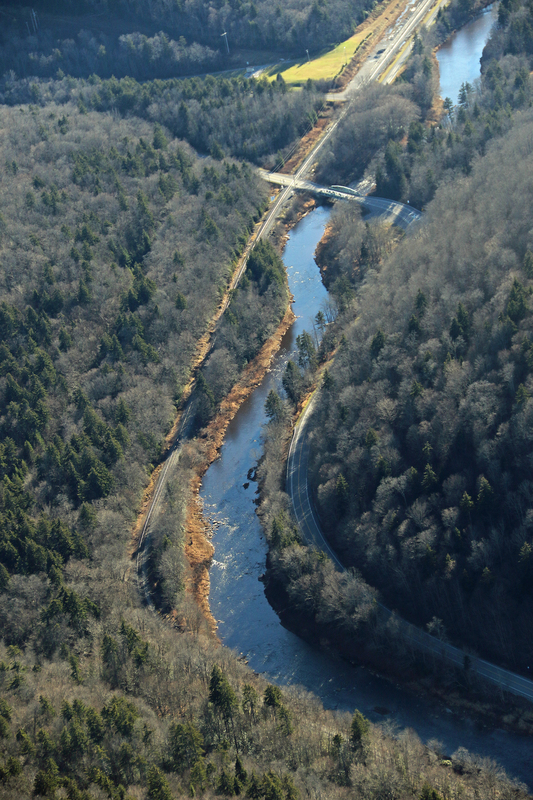 Shavers Fork at Cheat Bridge. 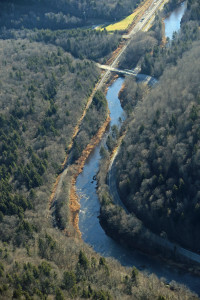 The pipeline would cross upstream.